While you won't be able to preview your thank you email unless you've made a donation, the screenshot below provides an example of a standard GiveGab donation thank you email, so you can see where your custom elements will fit in and be displayed to your donors! Your Organizations Logo - at the top of the email your organization's name and logo will appear so your donors know this email is coming from your organization. Your Custom Thank You Image or Video: Here is where your thank you image will be displayed, or if you chose to include a thank you video, a hyperlinked shot of your video will display here instead. Your Custom Thank You Message: Here is where your custom thank you text will populate in your Thank You email. 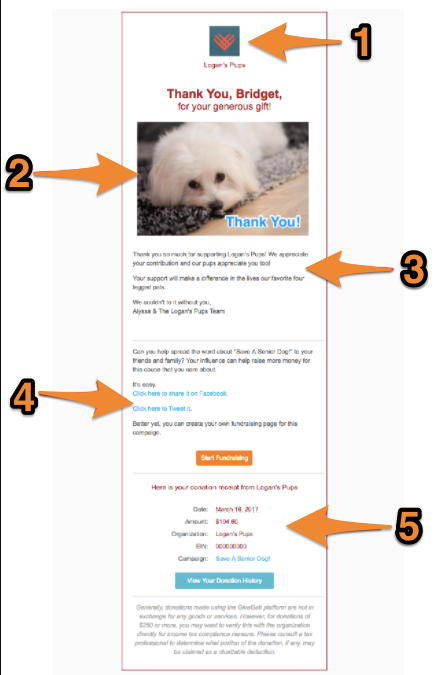 Empowering P2P Fundraisers: If a donor gave to a campaign with P2P Fundraising features enabled, they would see a prompt to encourage them to support your organization by creating their own personal fundraising page tied to your campaign. This is only available for campaign donors. Donation Receipt Information: The final portion of your Thank You email includes the donation date, donation amount, your organization name, your EIN number, and the campaign the gift was made towards if applicable. This portion of the Thank You message acts as your donor's tax deductible receipt! You can learn how to customize your organization's general Thank You message here, and a specific campaign thank you message here!